We do both! Boarding is offered to our customers who have bought a bird from us at $10/night per bird. If your bird was not purchased from our store, recent blood work and an avian vet’s health certificate is required to board with us. When you bring your bird(s) into the store for grooming it’s a great opportunity to see how your fine feathered friend is faring and to discuss any concerns you may have. For sanitary reasons we ask that you bring your own towel for wrapping your bird. We groom every day that we are open and STOP with the last client promptly at 3:30 p.m. to allow for thorough cleaning and sanitizing of our tools. 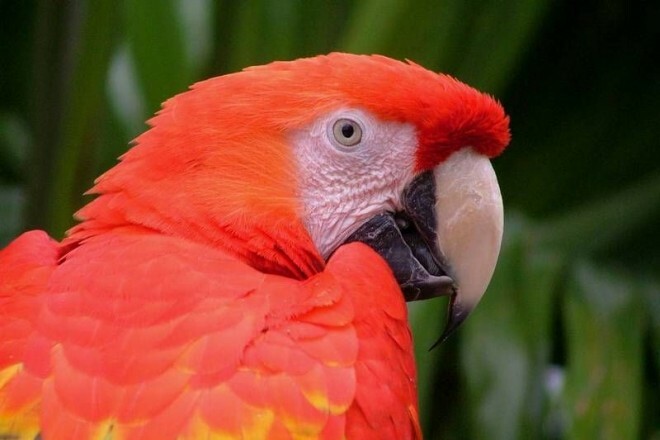 This does require more time with each family member and their bird(s) and is on a voluntary basis, however we highly recommend this assessment because it can tell you valuable things about your bird from malnutrition, an inability to absorb vitamin A to obesity and much more but you can certainly decline at the time of signing in. A file will be kept at our store for your convenience and filled out each time you come in for grooming and the best part of this added service is the history we keep on hand for your avian vet if ever needed AND it’s all FREE! In lieu of payment, we do accept donations for the SPCA. 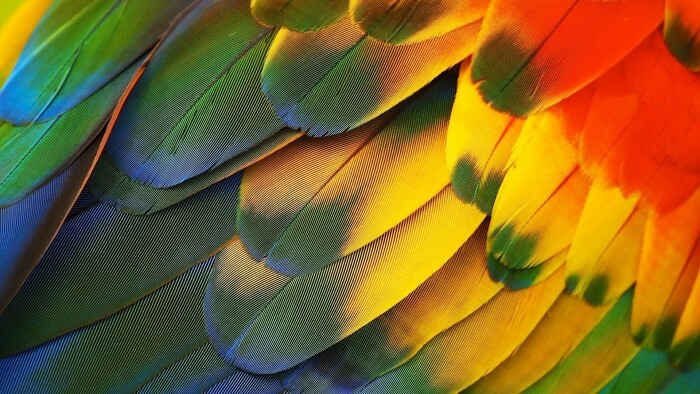 When we examine the feathers we look to see if the feathers are shiny and smooth without frayed ends. Is there evidence of powder down production? Also look for evidence of molting or new feather growth. It is often obvious to us and the owners a darkening, blackening or edging going on but depending on where we see the blackening and the fashion in which they appear can tell us lots about his or her ability to assimilation the current diet he/she is on or perhaps something more serious like hepatitis (liver disease). We look to see if there is abnormal feather growth or feather dysplasia? Feather dysplasia is more of a symptom than a disease. It means that the feathers are growing in abnormally. There are many diseases that can cause this. PBFD, nutritional imbalances, trauma, low humidity, poor lighting, and others. Feather plucking can be caused by internal problems too such as heavy metal toxicity, intestinal upset, intestinal foreign body, intestinal parasites, and others. Is there evidence of feather destructive behavior like chewing or plucking? Are stress bars present? As we take a peek under the wings we can also search along the feather shaft and at the feather base for signs of ectoparasites (mites). Fat deposits along either side of the keel can also create a part in feathers overlying the sternum so we can see and feel that as well. We’ll wet it just a bit and show you if we find these “fatty” deposits. So feathers are really the tall tell signs of a lot in your companion bird. Now this sounds more personal than you think! All this is is a quick peek inside your bird’s mouth actually the roof of his mouth with a small light. What we are looking for are these spikey finger-like projections alongside the choanal which is a V shaped cleft in his palate on the top of his maxilla (upper beak). What this tells us is how nutritionally healthy, past or current illnesses in your bird at the time. 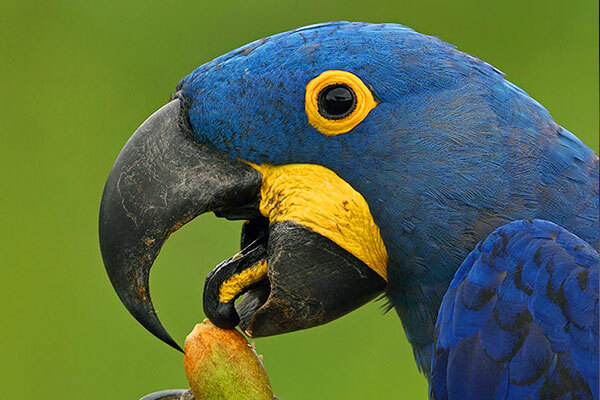 If birds have been recently converted to a healthier diet than the changes or regrowth of the papillae have not yet occurred. In laymen terms: Healthy-sharp, pointed projecting from the choanal borders are characteristic of a sufficient vitamin A assimilation. On the contrary: The presence of “blunted” shorter, rounded or change in coloration (ex: from a normal black for certain species to a whitish blunted tip) or absence of these papillae altogether is indicative of a lack of vitamin A assimilation. Individual birds challenged with obesity, also in our experience, have a tendency to prevent optimum assimilation of vitamins such as Vitamin A. So at your Grooming Plus+ visit…we weigh because weight is very important because dramatic fluctuations in weight, especially weight loss, could be your ONLY indication your bird is sick even though he may eat, play, talk and seem totally normal. Those with babies need to be especially diligent in weighing to be sure their baby is gaining small increments every day. Once they become adults the weight will stabilize. We recommend babies to be weighed every day and adults 1-2 times per week. Weighing should always be done in grams not ounces and at the same time of the day. If you see weight gain this is equally dangerous because birds who are over fed and under exercised can become obese which can cause a multitude of problems ie; cardiac problems, diabetes, fatty liver, etc. Just like us, a healthy and portioned control diet is best. If there is rapid weight loss that is your emergency light that says get to your avian veterinarian fast. Birds are experts at hiding their illness till the very end that comes from their not so far distant cousins being birds of prey. This dna still is built in so as to not let any possible predators know something is weakened or not well in him. A normal range for adults is on our website or posted at our grooming counter. Why do we check the eyes? Sometimes birds are clumsy or reluctant to fly not because she didn’t learn how her wings and feathers work but because the eyes of a bird is the most important sensory organ she or he has and unfortunately partial impairment for one or both eyes has far-reaching consequences that range from skittish behavior to aggressive biting. With a gentle passing of a light to see reactivity of the pupil (PLR-pupillary light reflex), can help possibly in detecting optic lesions, blindness or neurological disease or even head trauma. 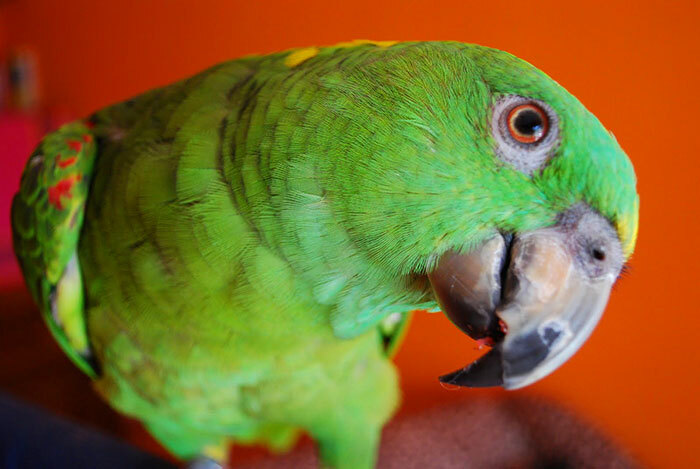 If you are concerned your bird may have partial or complete visual deficits then we can recommend you to an avian vet that could perform and ERG (electroretinogram). With Grooming Plus+ we hope to help catch early signs of a less serious nature. 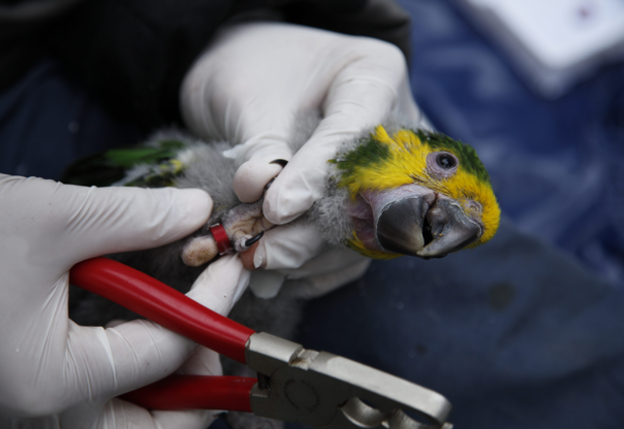 Evaluating bird’s feet is critical and is one of the most often missed ailments that affect pet birds and especially breeding birds with mere casual observation. Perhaps it’s due to the fact that the bird is standing on his feet all of the time! Pododermatitis or “bumblefoot” can result in many health issues and the severity is rated by grades. The causes of the various grades of pododermatitis are often correctable by the avian caretaker. Birds challenged with obesity, and lack of perch rotation are most certainly are prone to bumblefoot condition. Other causes include diets low in Vitamin A & E, excessive use of grooming perches, lack of exercise, and exposure to cigarette smoke.